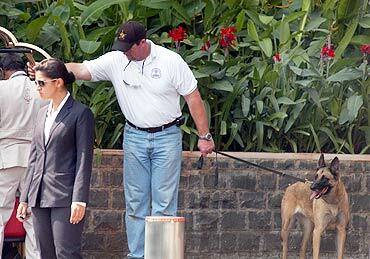 More than 40 Secret Service agents -- entrusted with protecting United States President Barack Obama and his family -- are in Mumbai and New Delhi, reviewing daily security arrangements at each of the locations that Barack and Michelle Obama are scheduled to visit, according to sources. 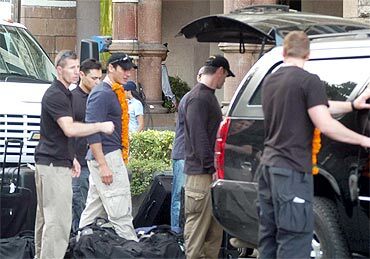 Some of them were spotted near the Taj Mahal hotel in southern Mumbai, which has turned into a fortress ahead of the US President's visit. Obama is expected to fly by a helicopter -- Marine One -- from the city airport to the Indian Navy's helibase INS Shikra at Colaba in south Mumbai. 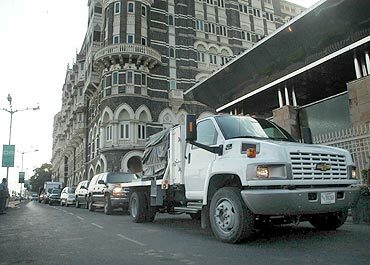 From there, he will drive down in Lincoln Continental -- the Presidential limousine -- to the nearby Taj Hotel. 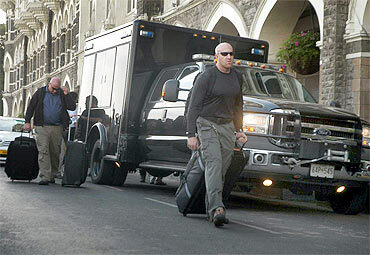 The President will have a security ring of the elite Secret Service, which is tasked to guard the President, along with National Security Guards and personnel from central paramilitary forces and local police in Mumbai and Delhi. Similar arrangements will be in place in Delhi, with the Air Force One to be kept in all readiness throughout Obama's stay from Sunday afternoon to Tuesday morning.